Prior to today, you could pre-order the Microsoft Surface Go tablet from the usual suspects like the Microsoft Store, Best Buy and B&H. Conspicuously absent from the list was Amazon, but that has now changed. Starting today, you can reserve the slate from Amazon while Amazon Spain is offering a 25% discount (in Euros) on the highest priced model. The tablets start shipping on August 2nd. Amazon's website in Spain has a 25% discount on the model with 8GB of RAM and 128GB of SSD storage. Instead of being priced at 599 EUR, the discount drops the price to 449 EUR ($524 USD). 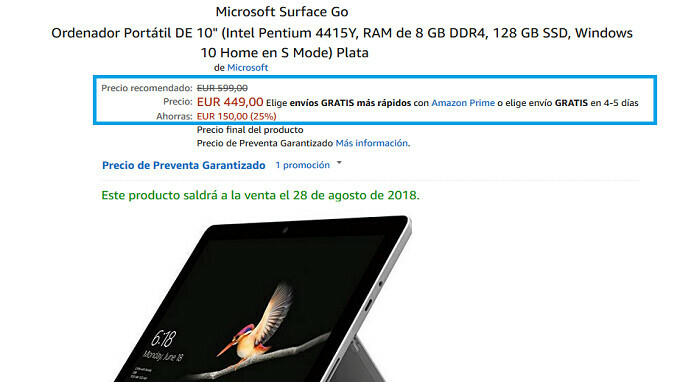 However, in exchange for what turns out to be less than a 5% price cut in dollar terms, you will have to wait until August 28th for Amazon Spain to ship the device (see the image at the top of this story). The Surface Go is equipped with a 10-inch screen, carrying a resolution of 1800 x 1200. Under the hood you'll find a dual-core 1.6GHz Pentium processor, and the camera combo from back to front weighs in at 8MP and 5MP. Not only is there a fast-charging Surface Connect port, there is also one for a USB-Type C connector. The battery lasts for up to 9 hours, and the tablet runs Windows 10 Home in S Mode. If interested in reserving a Surface Go tablet from Amazon, click on the sourcelink below. How much actual user space is available on the 64gb? Starting storage on a windows device should be 128gb. I think it would have around 40-45 but I'm only guessing, probably won't know until reviews are out. Hard to say. One thing is a fresh device and another is few cumulative updates later ... or even anniversary update later. Yeah 64GB on Windows and especialy eMMC is a pain to use. It can be done, I even tryed 32GB eMMC Win tablets, but it is a painful experience.